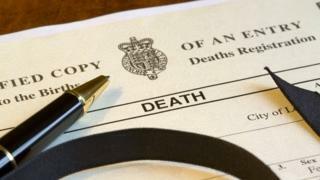 The price of a getting a death certificate will nearly triple from this weekend in England and Wales. Families registering a death will be charged £11 from Saturday for each certificate, up from £4. Costs for birth and marriage certificates are changing as well, but pricier death certificates will have the most serious impact. Relatives sometimes require up to 20 certificates to prove to different authorities their loved one has died. Certificates might be needed to prove a death to a life assurance company, or send to banks, building societies and investment firms. Where shares are held, you can be asked to send in a Certificate of Registration of Death to get ownership transferred. Even if the deceased person's affairs are fairly simple bereaved families may well require five or 10 certificates. If the latter, the cost will rise from £40 to £110 for bereaved relatives at a testing time. Some local authorities have already posted the increases on their websites, including Wigan, Gloucestershire and Kingston. Kingston Council in London told BBC News that the increase was set by the General Register Office, which answers to the Home Office. "The increase to £11 is mandatory," said a council spokesperson, "and is effective across England and Wales from 16 February 2019." What do people want to happen at the end their life? While the price of marriage and birth certificates are rising by a similar amount, people seldom need more than one copy. Ordering extra copies retrospectively can also cost more. More than half a million people die each year in England and Wales, so the price increase is likely to bring in millions of pounds. The Home Office said the price rise was the first increase since 2010. "The fees are set at cost recovery levels only, and registration officers have power to waive or reduce fees on grounds of compassion or hardship," a spokesman for the Home Office said. Terry Tennens, chief executive of the National Society of Allied and Independent Funeral Directors, said the trebling in price of a death certificate was "highly inappropriate" in the current economic climate. The price of a death certificate ordered online from the General Register Office will go up from the current rate of £9.25 to the same higher cost of £11.